A wonderful conservation project is currently underway in London. Five hundred bumblebees were released from a London rooftop as part the London Pollinators Project, led by Queen Mary University. 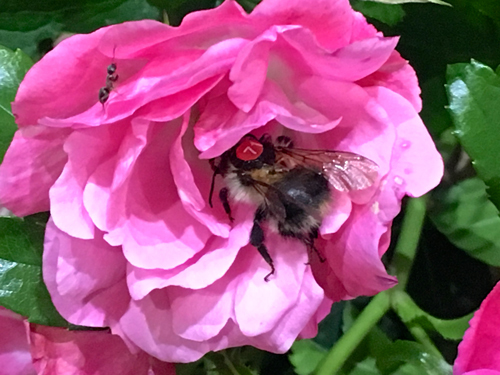 They have tagged individual bumblebees with a small numbered ‘Licence Plate’ numbered back disk, so members of the public can get involved by photographing and alerting the University when one is spotted. They hope that by gathering information such as their movements they can better understand their urban habitats and behaviours. They also hope that the license plates will encourage a better relationship between people and the bees of London. We at The Hive Honey Shop applaud this project and are excited to spot one ourselves!! We have been deeply involved in rescuing and rehousing bees nests and swarms for over 25 years. The Hive Honey Shop are proud of our no profit service and enjoy the knowledge that we have helps save millions of bees from destruction from pest control companies or frightened home owners. So to hear about this current project make us VERY HAPPY in deed! We encourage everyone to get involved and start looking out for these marked bees. It’s also a great way to get young people involved and educated them about the importance bees make to our planet, vital for pollination and our eco-system. Well done Queen Mary University! Also Queen Mary University have a photo completion. Nature lovers can win a £100 voucher in a competition for the best photographs of the insects.